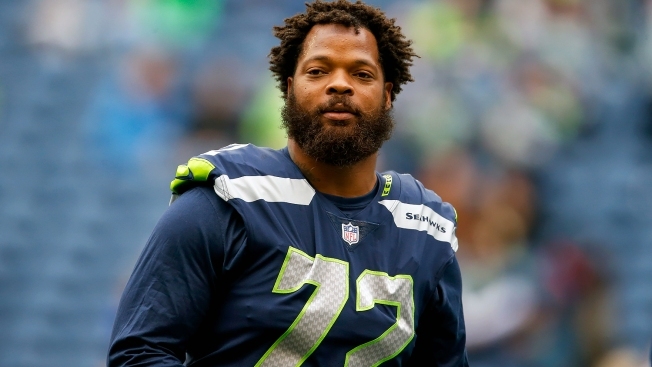 Authorities issued a warrant Friday for the arrest of Pro Bowl defensive end Michael Bennett, accused of injuring a paraplegic woman as he tried get onto the field at last year's Super Bowl to celebrate with his brother. The Harris County (Texas) district attorney's office said the warrant was issued after a grand jury indicted Bennett on a felony count of injury to the elderly. Bennett was a spectator at the game at NRG Stadium in Houston in February 2017 when he tried to get onto the field immediately afterward to see his brother, Martellus Bennett, a tight end for the Patriots at the time, officials said in a statement. Prosecutors allege he pushed through security personnel, including a 66-year-old disabled woman who had told him to use a different entrance to access the field. The woman, who was using a heavy, motorized wheelchair, suffered a shoulder injury when police say Bennett pushed her out of the way. The chair was so heavy it didn't move so the woman took the full brunt of the push, police said. Authorities said Bennett also pushed two other stadium staffers out of the way, forced open locked doors, and disregarded an officer's commands. The charge of injury to the elderly can be filed if a person intentionally or knowingly causes injury to a person 65 or older. It carries a penalty of up to 10 years in prison and a $10,000 fine. Harris County authorities say they're talking with Bennett's legal team about surrendering on the charge. The Philadelphia Eagles earlier this month acquired Bennett from the Seattle Seahawks, where he became one of the dominant defensive linemen in the game. In a brief statement, the Eagles said they are "gathering more information" on the case and didn't have further comment at the moment. Bennett's agent, Doug Hendrickson, did not immediately respond to messages seeking comment Friday. Bennett had 8 ½ sacks last season and has 54 in his nine-year career. The 32-year-old Bennett has three years remaining on his contract, with a base salary of just $1.65 million in 2018. That number jumps to $6 million in 2019 and $7.5 million in 2020.